A narrow defeat to Arizona State was a start, but the Aggies can't wait. Last Thursday, New Mexico State football started its final season in the Sun Belt facing an early 14-0 hole vs. Arizona State. The deficit was not ideal for any time, but this particular season has become a critical one for the Aggies. Along with Idaho, NMSU was voted out of the Sun Belt — the rest of its membership sitting time zones away — in 2016. But unlike the Vandals, New Mexico State elected to stick around the FBS, where its football program has resided since the early 1930s. In that time, it’s played in just three bowl games, and none since the 1960 Sun Bowl (the team was 11-0 and finished the year ranked). Despite that run of nearly 60 seasons now without a postseason bid, the Aggies elected give it a shot as an FBS Independent. It’s not the first time the program’s done so. But if this try fails to work out, it could also be its last. And that’s what makes this season so critical for New Mexico State and Coach Doug Martin. What it’s able to do here in its final Sun Belt season sets the tone for 2018’s “year one” in the wilderness. Strangely enough, however, the Aggies will have company as a program without a home — and no clear solution arriving soon. Next year’s list of independents include your obvious ones like Army, BYU and Notre Dame. Those schools have shown an ability to be successful national brands as unaffiliated teams, and have potential suitors available if ever they decided to join a league. But New Mexico State is out in the cold unless the Mountain West has a change of heart. Similarly, UMass sits waiting for Conference USA or the American to change their minds on expansion. Transitioning from the FCS level, Liberty is looking to position itself similarly to the C-USA or Sun Belt. That predicament likely puts a finite timer on how long each of those programs can stick around in the FBS. But perhaps NMSU most importantly. The school’s endowment is small (201st in the country as of last year), as is its recruiting base in New Mexico. As mentioned, the wins haven’t been all too frequent over the years, with the all-time record sitting about 200 games under .500 right now. The Aggies’ recruiting rankings are arguably the worst in the country over a two- and five-year stretch. As SB Nation’s Bill Connelly said in his February preview, the time is now (this very second) for the program to suddenly figure itself out. And that’s where last Thursday’s game comes into play. 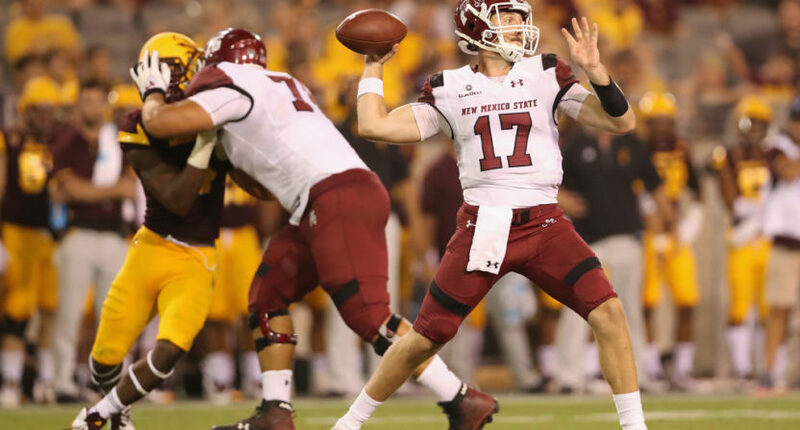 Visiting a Power Five team and losing is nothing new for New Mexico State. But this loss at least felt a little different. Despite the early deficit, NMSU came within one point by halftime. Facing a 24-pont gap in the fourth quarter, they’d narrow it all the way to six as time expired. A garbage time touchdown doesn’t change a game they were outmatched in. However, staying in a game like that does help change some of the perceptions the program has around it. Perceptions that will need to be forcibly shifted by New Mexico State in the coming months. The Aggies have a capable senior quarterback in Tyler Rogers (398 passing yards last week) and another quality senior in wideout Jaleel Scott (149 receiving yards). But those players are gone next year. In some ways, it presents an opportunity to sell: “Our best guys are leaving and you’ll get a shot to play early.” It also puts them at a disadvantage of having to start over, though, at a time when the program can ill afford to. New Mexico State doesn’t just need to sell recruits on playing for them. It needs to sell opponents on the value of heading to Las Cruces. You can’t change the location of the city. You can change the quality of play. Major conference teams are never going to knock down the door to play at NMSU. Look at the 2018 schedule for proof there. Five home games (the bare minimum for FBS eligibility) and an opponent list that includes Wyoming, New Mexico, Liberty, Georgia Southern and Alcorn State (FCS). The 2019 schedule isn’t done, but the home games so far are UTEP, Liberty and UL-Lafayette. That slate’s not going to get fans or players in the door. For as much as UMass’s decision to go independent has been panned, it’s been able to attract enough regional foes, neutral site (Foxboro’s Gillette Stadium) games and opponents like USF and Mississippi State to make it worthwhile for now. New Mexico State’s back is against the wall, but competing well enough with Arizona State is a start. How they finish is a story that will develop in the coming months.